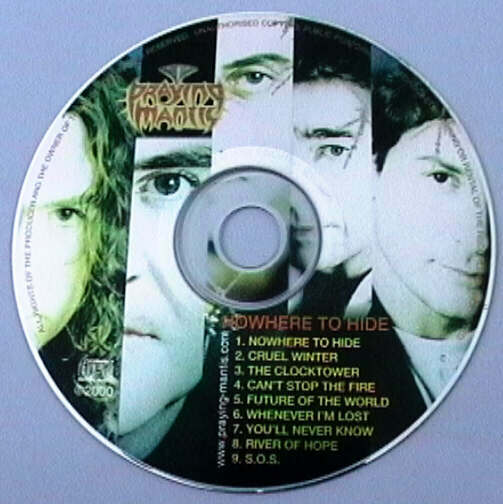 In order to promote "Nowhere To Hide" at the 2000 Wacken festival Praying Mantis printed up 500 copies of this Picture disc. It comes in a clear plastic sleeve. I have some copies of the album available through the Web site. They cost £7 plus postage and packaging. This is 50p (£7.50 total) for the UK and £0.75 (£7.75 total) for Europe and £1.50 (£8.50)for the rest of the world. I have a Paypal account so I can accept payment that way or in UK cash, cheques or International Money Orders. If you are interested please e-mail me.